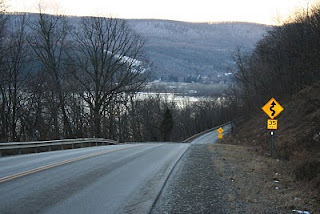 Last Tuesday, February 23, Andy Blocksom tried to convince the Town of Owego Planning Board of the merits of Patriot Water Treatment's request for a special use permit for floodplain development. When the votes were tallied, he came up one short. The board voted 3 to 2 in favor of recommending the permit, but apparently they needed four to make a majority. As a result, they cannot recommend action for the Zoning Board of Appeals - which is where Blocksom will be arguing his case on March 10. Though I was not at the planning board meeting, one of my citizen-journalist colleagues took loads of good notes. 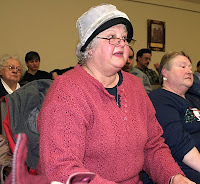 According to Frank, more than 100 local residents showed up to hear the the ruminations of the town planning board, filling up the seats and lining the walls of the auditorium. Prior to the vote, planning board chairman Robert Rieg explained that the board has the responsibility to approve or disapprove proposed site plans. However, because the proposed Patriot Water Treatment facility lies within the 100 current year flood plain, a special use permit is required. That permit must be approved by the zoning board. So, explained Rieg, the planning board could only provide a recommendation to the zoning board. If the zoning board approves the special use permit, Rieg said, then the planning board would address Patriot’s site plan. But, Rieg emphasized, prior to any planning board decision on a site plan, a State Environmental Quality Review (SEQR) must be completed, with either the zoning board or planning board taking on lead agency status. As in the Feb. 17 meeting, Blocksom, assisted this time by civil engineer David Marnicki and attorney Sarah Campbell, answered questions about frack water storage at the facility. Planning board members asked for specifications on the water holding tanks, fresh water impoundment, specifics about treated water leaving the facility and how water was tested and monitored throughout the treatment process. They also asked about qualifications for employees operating the treatment facility as well as plans for entrance and egress for trucks hauling wastewater to the facility. Even though it was not a public hearing, Rieg opened the meeting for public comment. He noted that since the October meeting, the planning board had received 25 e-mails and letters commenting on the proposed project. Echoing discussion from the previous week, residents raised concerns about truck traffic. Some people commented that four trips inbound means four trips out, a total of eight truck trips per hour along the road. This is a lot of noise and toxic exhaust, they pointed out. Residents did not seem impressed by Blocksom’s description of how the tanks of material would be moved in an imminent flooding situation. They didn't like the idea of having a facility that treats hazardous waste located in the flood plains and so close to wetlands. At the end of the night Rieg told Blocksom, “Maybe your process has potential, but you picked a lousy site." What’s next: On Wednesday, March 10 the Town of Owego Zoning Board of Appeals will hold a special meeting to consider Patriot Water Treatment’s application for a special use permit for floodplain development. The meeting will be held at 7 pm in the Hubbard Auditorium (56 Main Street). Patriot Water Treatment is the only item on the agenda. For more information please contact the Town of Owego planning department at 687-0123 ext. 6. Pennsylvania DEP's scribes are having a busy day today. After sending out a notice about plugging an abandoned well in Moon township, this afternoon they zip out another note - this one about Schreiner Gas & Oil. Seems that drilling activities by Schreiner affected water supplies at two homes in Bradford Township, McKean County. DEP had previously determined Schreiner was liable for affecting the water supplies of homes in the Hedgehog Lane area of town. Schreiner restored water supplies at seven homes, but had not resolved the problem at two other residences. According to DEP Regional Director Kelly Burch, Schreiner had installed treatment systems at these two homes but those are only a partial solution. The original DEP order calls for Schreiner to rectify the situation completely. The DEP press release notes that Schreiner has been actively drilling combination oil and gas wells in Bradford Township since 2008. Because they did not establish background water quality in the area prior to drilling, now Schreiner must demonstrate that the contaminants in the affected water supplies do not exceed the maximum contaminant levels established under the Pennsylvania Safe Drinking Water Act. Water testing by DEP identified a number of contaminants including: total dissolved solids, chlorides, manganese, iron, dissolved methane and ethane gas. Now Schreiner has10 days to submit a permanent water supply restoration plan for the two remaining residences to the DEP. After DEP approves the plan, Schreiner has 30 days to implement and complete it. Schreiner must also continue to maintain the other seven water supplies and must "improve cement casing at three of its drilled oil/gas wells to prevent groundwater contamination." Under the DEP order, Schreiner is to apply within 60 days to have any of its 15 abandoned wells placed in inactive status or to plug the abandoned wells fully. Until the gas migration issue is resolved fully, Schreiner cannot drill any new wells. The Pennsylvania Dept. of Environmental Protection alerted the press that they have hired a contractor to plug an abandoned well in the residential area of Moon Township, Allegheny County. This action is being taken to prevent "potential gas migration" from an abandoned well that is currently releasing natural gas into the air. "The work, which is being performed under an emergency contract with Hydrocarbon Well Services of Buckhannon, WV, will protect the public by preventing gas from migrating through the soils and away from the well. There is no indication that the well poses a risk to area residents or to children attending the nearby J.A. Allard Elementary School, but until the work is completed, DEP advises the public to keep a safe distance from the well." A property owner discovered the well last fall when he was clearing brush from the area. At that time DEP inspected the area and put the well on a list of abandoned wells to be plugged. But since February 6, residents have been calling DEP with numerous odor complaints. DEP inpsectors revisited the well and discovered that a hole had been eroded into the casing, allowing the release of pressurized gas. DPE spokesperson Helen Humphreys noted that because abandoned wells can cause many problems, the Oil and Gas Act of 1984 requires well operators to plug non-producing wells. "However," she told the press, "many wells were abandoned prior to when state regulations took effect." So the state legislature amended the Oil and Gas Act in 1992 to allow wells abandoned before April 1985 to be classified as “orphan” wells. That gives DEP the authority - and the financial means - to plug them. For more information, visit www.depweb.state.pa.us or call 412-442-4000. My new friends in the Marcellus. As I return from almost a full week touring the Marcellus, I reflect on all the people I met for the first time. Many of these people had spoke via phone or email with me on several occasions; however, most had never met me in person. These folks welcomed me into their homes as though I was a lifelong friend or family member, not a complete stranger, who lived thousands of miles away. I was impressed with the genuine values that my new friends possessed. I could not begin to try to thank everyone individually, so I will just say thank you to everyone I met on this trip. Although I was invited, and a few worked extremely hard coordinating my packed schedule, this really was a vacation for me. My new friends just gave me a reason to see this new land, like I had not seen it before. It had been burning inside of me to see how other gas shale plays were being accepted, and if the companies acted better there than they did here in DISH, TX. Although, I spoke at a dozen events during this tour, meeting new people and sharing their experiences was the real joy. It was purely amazing at how many people traveled across snow-packed roads, and got up early on Saturday morning to let me share our story. Also, there were dozens of public officials who opened their minds to listen to me speak. During five days of speaking, almost 2,000 people came to hear the story of DISH, TX. What further amazed me was that no matter where the event, the seats were full. Whether, the church in Oneonta, school in Downsville, or the movie theater in Elmira, the seats were pretty much full, all the way until my last talk in Callicoon, that was standing room only. It amazes me, that this many people came to share our stories. The crowds continued to grow, and I reached almost 1,000 people on Saturday alone. What was even more amazing was that even those who did not share my views were respectful and courteous. Some of my friends in the industry had went to great lengths to create a hostile environment for me in the Marcellus, and that simple did not happen. Even those who asked the hard questions, which I welcomed, were respectful. I was further impressed by the convictions of my new friends to their cause. Many had turned down the opportunity for vast fortunes, and chose not to climb into to bed with the energy company landman. When approached with these prospects, they simply said "no". I am not sure that I have ever met such a large group of unselfish people in my life. Willing to forgo money to hang on to their way of life. I am not sure how to describe the respect I now have for my new friends. My main purpose for this trip was to let people know that there was more to natural gas exploration than a signing bonus, and a monthly royalty check. It had been my hope to allow folks to make a decision with their eyes wide open, not their eyes wide shut. I think there were many that began to think about this for the first time after listening to the story of the town that was sacrificed for the good of the shale. There are some that will never listen, and only look for the one thing that can give them a reason to say "it won't happen here". For those, it would not have mattered what I would have said, their minds would not be clouded with the facts, it was already made up. Another reason for wanting to take this tour, was to see for my own eyes how others were being affected by the shale boom. I have been trying to get stricter regulations here in TX and urged my new friends in the Marcellus to pursue the same. If this extraction of natural gas is going to take place, it must be tightly regulated. However, some of my new friends don't believe that it is possible to perform this safely, even with the tightest regulations. After visiting Dimock, PA, it was hard to argue with their logic. I got to meet the lady whose water well exploded, and tears filled my eyes when I heard the story told by another lady whose children would get sick after drinking the water from their once clean water well. I saw the tainted water from another poisoned well, and frankly, was not prepared for the emotions felt when we delivered fresh water to a family that had been refused this right by the drilling company. Some were getting water delivered by the company who poisoned the water, but a few were denied one of the simple rights that we should all expect as hard working Americans. Cabot Oil and Gas, has essentially turned this small neighborhood into a third world country, and won't even show those they are poisoning the courtesy of delivering water to them. These families would have surely been better off, if the shale had passed them by. In DISH we have dealt with the air toxins, but unfortunately we have not given the water much thought. There certainly have been issues with water here in the Barnett Shale, but nothing like water wells exploding. However, that does not mean that we do not have water quality issues, it just means we don't know it if we do. No one knew six months ago that we had toxic levels of chemicals in the air surrounding several natural gas wells and production facilities, and therefore, we should think about our water here as well. This trip made me think about issues that I not previously thought about, and that was the greatest gift I received. I have never been to a place where I received such a warm reception, and on some days I was passed through several people. By the end of the week, you would have thought, I had lived there my entire life. I even got to see the local hero Josh Fox, who put me in his now famous documentary GasLand. Some even went as far as to declare that I had been adopted as their own mayor. And though I missed my family something terrible, I was saddened to have to leave such a clean and beautiful place, and return to the dirty ole town. I can now see why my new friends want to maintain their clean air and clean water, and I hope to help them do it. I am glad to announce that I will be returning to the Marcellus Shale in April, to complete my tour, and see my new friends again. Thanks again for accepting that crazy mayor from Texas into you homes and lives. I hope it was a good for you as it was for me. Please post this on your blogs or pass on to your mailing groups. Last Wednesday, February 17 Andrew Blocksom returned to the Tioga County Planning Board with a revised site plan for his proposed frack-water treatment facility. The planning members voted 5 - 2 in favor of the revised site plan, just shy of the 6 votes needed for a majority (5 members were absent that night). A recommendation is nice, but not necessary. The true hurdle comes this Tuesday, Feb. 23 when Patriot's site plan comes up for review by the Town of Owego Planning Board. 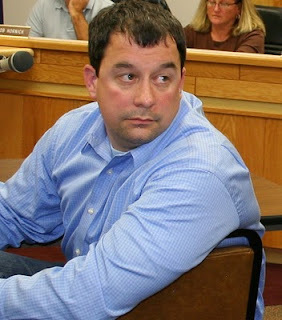 Blocksom is one of the owners of Patriot Water Treatment LLC. 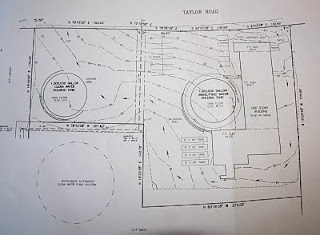 Back in October, when he presented his original plan to the county planning board, they approved his site plan and sent him on to the Town of Owego Planning Board. The members of the town planning board thought Blocksom needed to do some homework. Instead of approving the site plan, they sent him home with a long list of questions. The basic plan is the same: convert the old Chevy dealership on Taylor road into a frack-water treatment plant. The site is already located in an industrially-zoned area, and Blocksom feels it's ideally suited for his business. 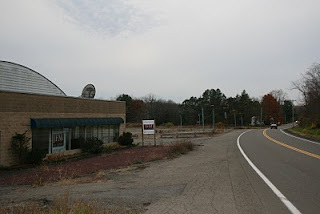 The existing building would house the distilling equipment and the paved lot and driveways provide ingress, egress, and room to park extra tanks if needed. Trucks will drive up to a docking bay and pump their loads of flowback and frack water into a holding tank. From there the water will go through a vacuum distillation process, where metals and other contaminants are separated from the liquid, and the distilled water will be pumped into trucks waiting to haul it back to the drill sites for reuse. There are some differences, though. For one thing, Patriot had to "flood-proof" their facility, as the old FEMA maps show that area in the flood plain. (The new maps don't, and Blocksom will likely appeal that in a meeting with the town planning board this Wednesday.) Patriot needs to insure that any tanks will not be breached by flood waters. “We’re putting in tanks for both the frack water and the clean [distilled] water,” Blocksom said. The 1-million gallon tanks will have 2-foot thick foundations as well as containment tanks that will hold any spills or leaks. Tanks holding the solid waste and sludge left at the end of the process will be mobile and, Blocksom said, they will be moved in the event of a flood. for metals, ethylene glycol and other volatile organics, and radioactivity. He promised that his facility would not take wastewater contaminated with high levels of any of those things - and that trucks hoping to recycle such wastewater would be sent to injection wells for disposal. Owego village mayor Ed Arrington raised concerns about the noise from the estimated 4 trucks/hour all day long every day of the week. He pointed out that there are only two routes to get to the proposed facility: one is the steep Bodle Hill Road and the other is right through the heart of the village. 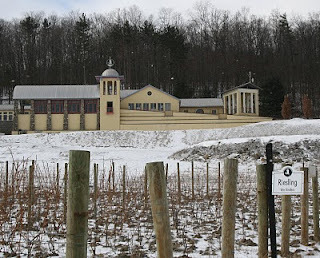 photo of Heron Hill Winery, just a few miles south of Pulteney along the Keuka Lake wine Trail. Today Chesapeake Appalachia LLC officially and formally withdrew their permit applications for converting the Bergstresser well into a class II underground injection (disposal) well. In letters to the US EPA and the NY State Dept. of Environmental Conservation (DEC) William Fowler, writing for Chesapeake, states that Chesapeake has "determined that we no longer require" the permits needed for turning the old gas well into a disposal well for drilling wastewater. Their main reason - they told the EPA - is their "enhanced operational capability to reuse/recycle water produced from development of natural gas resources in the Marcellus Shale. But to NY's DEC Chesapeake says their decision is based "primarily in the fact that the state will not allow completion of Marcellus Shale wells" until the SGEIS is completed. And, Fowler adds, once Marcellus wells are drilled in NY Chesapeake will "evaluate the need for any supplemental disposal facilities". One thing Chesapeake is adamant about: their decision to take their permits off the table has nothing to do with the disposal facility posing a threat to the environment. Nor does it have anything to do with the very vocal opposition to the project. Ha! say the 400 to 500 folks who tried to find seats in the Pulteney Fire Hall just 9 days ago. Ha! 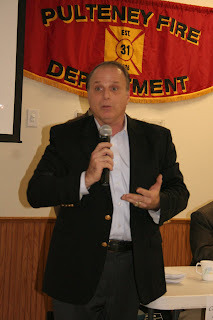 says Congressman Eric Massa who, today, congratulated the families of the Finger Lakes on their victory. 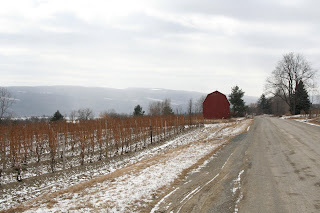 "The concerned citizens of the Finger Lakes showed everyone that a strong grassroots movement can defy all odds and emerge victorious," Massa said in comments to the press this morning. Some politicians may try to swoop in and take credit for today's news, Massa said, but this victory clearly belongs to the people who fought to protect their homes. And Jeff and Jodi Andrysick shouldered much of the work: they organized petitions for a moratorium as well as the two meetings in the Pulteney Fire Hall. But the residents of Pulteney - and indeed residents across upstate NY - need to worry about more than just this single well. Conversion of an old gas well into an injection well will set a precedent in NY, warns Walter Hang, president of Ithaca-based Toxics Targeting. “If this disposal well is successfully built, it will only be the first of many," he told the gathering at the Fire Hall on the 7th. 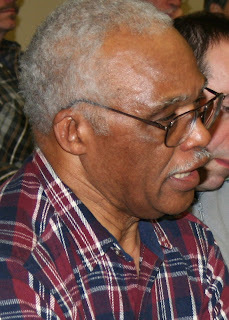 Hang's words echo those of Penn State Cooperative Extension agent Tom Murphy. During a webinar last month, Murphy said that old Trenton-Black River wells make ideal underground injection wells. He believes that gas companies will continue to drill into Trenton-Black River because once they extract the gas, the TBR wells give companies a place to dump their Marcellus waste. There are currently 112 active Trenton and Black River wells in New York State. Most of these are located in Steuben County (where Pulteney is located), but more than 40 are located in Chemung County, just a left turn and down the road from me. While the wells are labeled "active" on the DEC website, clicking on their production records reveals that - at least a few of the wells - aren't lining anyone's pockets with income. To a company desperate for disposal options, these wells look like holes in the ground just waiting for frackwater. Right now now one's drilling horizontal Marcellus wells in NY, but once they get the go-ahead and the Marcellus drilling takes off, the question of what to do with the millions of gallons of wastewater will become more acute. While gas companies eye depleted Trenton-Black River wells as potential disposal sites, environmental activist and lawyer Rachel Treichler says, "No community is a proper site for a deep injection well disposing of toxic fluids." There are, she says, too many reports of contamination and earthquakes from these types of wells. Right now, Treichler says, the gas industry has no adequate means of dealing with the toxic wastewater produced by hydrofracking in the Marcellus shale. So, she adds, the New York legislature should not allow hydrofracking in the state. So, even as people celebrate Pulteney's victory the rest of us need to keep an eye on the neighborhood gas wells. On Superbowl Sunday close to 400* people crowded into the Pulteney Fire Hall to protest Chesapeake’s plans for converting a natural gas well into a disposal well for frackwater and brine. People vied for leaning-space against the wall and unlucky late-comers lined up four-deep in the lobby, just beyond the notice warning “maximum occupancy 278 persons”. 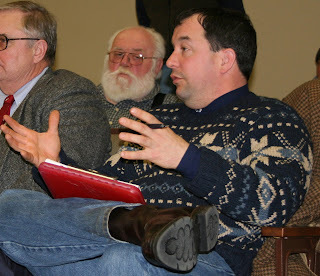 They were there for a two-hour forum on fracking, geology, and disposal wells. And it was pretty clear that no one was in favor of becoming the dumping site for Marcellus frackwater and brine. It took a few days but Chesapeake finally responded. 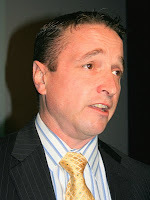 In a one-line e-mail to the Corning Leader, Matt Sheppard, Chesapeake’s senior director of corporate development wrote, “Our enhanced water re-use techniques have greatly diminished the need for us to dispose of produced water, therefore, we have no intention of pursuing the injection well in Pulteney, N.Y."
At issue: conversion of a natural gas well into a disposal well for Chesapeake to dump wastewater from their Marcellus and other gas wells in NY and PA. The well in question is the Bergstresser well, drilled 6700 feet into the Trenton-Black River formation about 13 years ago. It's not producing natural gas anymore, but it is deep enough that it would make an ideal place for disposal of brine and frack water. Only one problem: the good people of Pulteney, NY don't want it. 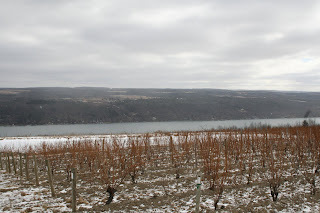 The tiny town of Pulteney overlooks the most western shore of Keuka Lake; it's a scenic area best known for its wineries and summer tourists. And as far as the residents are concerned, the heart of wine country is not a good place for toxic waste disposal. Not only that, the county road is twisty and turny and steep in places. The folks who drive those roads are concerned that the increased truck traffic will damage their roads. If Chesapeake's numbers are any indication, there will be plenty of trucks traveling the rural roads. According to their application, Chesapeake plans to inject up to 181,440 gallons of wastewater a day into the well. They haven't done any actual testing - but are basing this figure on data from injection wells in other locations. Given that the average brine-tankers hold close to 5,000 gallons, that means 35 or more trucks will drive the country roads hauling that wastewater - 70 truck trips in and out of the disposal facility every day for the next ten years. But wait! There's more! To handle that amount of wastewater, Chesapeake plans to build six concrete unloading bays. Trucks will dock at the bays and pump wastewater into one of six 1,000-barrel (42,000 gallon) above-ground storage tanks. Pipes will connect the tanks to a filtration vessel, and from there the wastewater will be pumped into the injection well. In addition, Chesapeake noted that they may need to add corrosion inhibitors and biocides to the wastewater. So they will store chemicals on site as well. But if Chesapeake hopes to drive those trucks up Route 76 to Pulteney, they'll have a few roadblocks. One of those roadblocks is junior Congressman Eric Massa who expressed outrage at the idea of placing a drilling wastewater disposal well so close to a lake. They're not going to frack wells in the NYC watershed, Massa said. "What does NYC have that we don't?" Massa promised to do everything in his power to stop the project. Including, he said, laying down on the road in front of the trucks. For now it looks like Massa won't need to get his suitcoat dirty, though, because Chesapeake seems to be cowed by the intensity of the protest against the project. At least for now, the folks of Pulteney are the winning team. 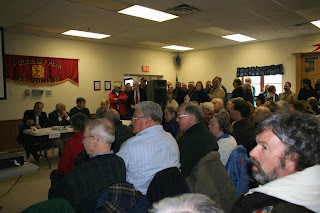 * as of 2/12/2010: organizers of the event estimate there may have been as many as 540 at the Fire Hall last Sunday. In the space of a week, give or take a dozen hours, five drivers received citations for overweight trucks hauling loads to gas drilling sites. On Tuesday, January 26, Kevin Parsons parked his truck on Covered Bridge Road in Burlington Township, Bradford County, PA. He was driving a truck for Hodges Trucking Company, out of Oklahoma City, Oklahoma, a company that is listed by Chesapeake Energy lists as a subsidiary on its Web site. Had Parsons read the road signs he would have known that Covered Bridge Road is posted for a weight limit of 10 tons, and he might have chosen a less conspicuous place to park. You see, the state police noticed the truck because it was parked illegally. They thought it looked a bit heavy, so they hauled out their handy-dandy scale and discovered that Parsons' truck weighed more than 51 tons. Not only was that 41-plus tons over the posted weight limit, but that's a lot of extra tonnage to be hauling around on two-lane gravel-and-oil country roads. The police also found a whole bunch of permit violations and fined Parsons $25,000. Then, just yesterday the state police fined four more drivers of gas industry service trucks for hauling illegal oversize loads. The guys, driving in a convoy, were stopped on US Route 6 in North Towanda. They were employed by T.K. Stanley Inc., an energy industry services company based in Waynesboro, Mississippi, a company that provides everything from roustabouts to preparing drilling sites to trucking in the drill rigs and equipment. Their fines ranged from $1440 to $6600. Unfortunately, the truckers couldn't post bail and were sent to the hoosegow to cool their heels. Ask people what they're concerned about with drilling and somewhere near the top of the list is "truck traffic". People worry that overweight trucks will put undue wear and tear on the road. They worry that the increased amount of traffic will put additional wear and tear on the roads. They worry that speeding truckers may run into school buses (this has also happened recently; thankfully no one was hurt). They worry that truckers from Oklahoma and Alabama may not know how to drive on steep icy mountain roads. Well, maybe after this winter the good folks in Oklahoma will have mastered the art of steering into a skid, but still, these concerns are valid. But what really galls most people is the idea that the gas companies will tear up the roads, extract the natural gas, and skip town leaving the taxpayers to cover the costs of repairing the roads. People are outraged at the idea that the public will be subsidizing the profits of wealthy multinational corporations - and a few lucky landowners who happen to strike it rich.